Observatory helps you collect, curate and share the astronomical images that you’re passionate about. 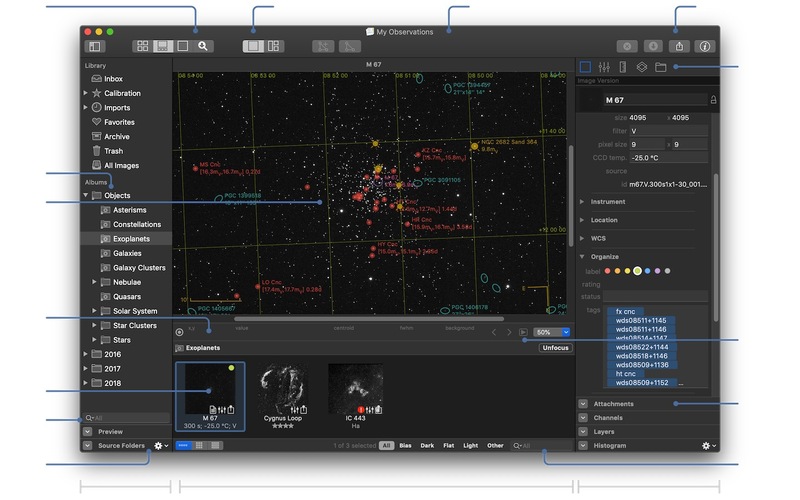 Observatory is an image management application specifically designed for astronomy. It helps you keep your astronomical images organized with albums, smart albums, tags, ratings and color labels. 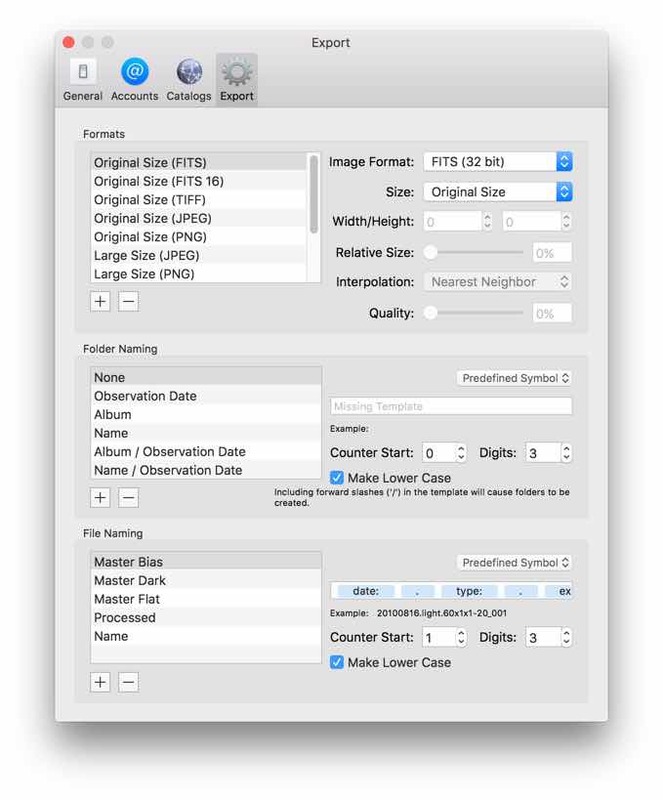 You can use Observatory to create master bias, dark and flat frames, calibrate, register, stack and adjust your images, all nondestructively. 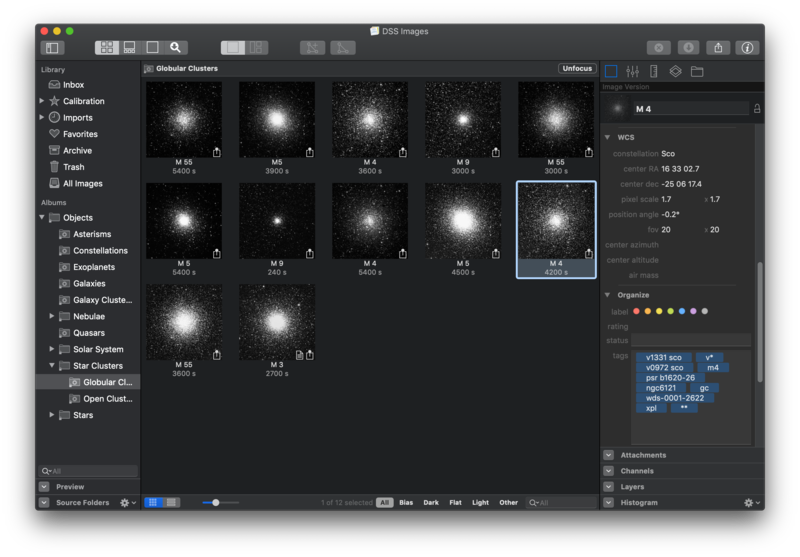 Add notes, plate solve, have it automatically tag your images, and overlay astronomical catalogs. 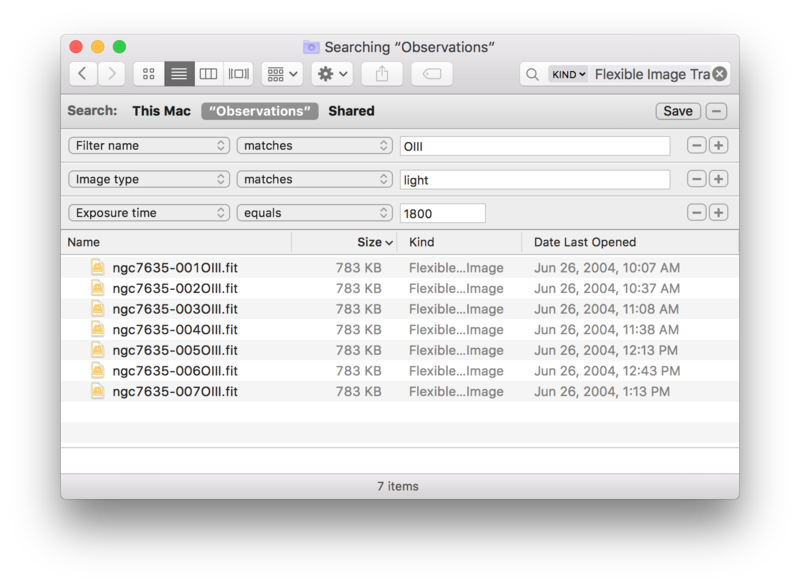 Observatory even lets you search and download research images directly from 10+ professional image archives. 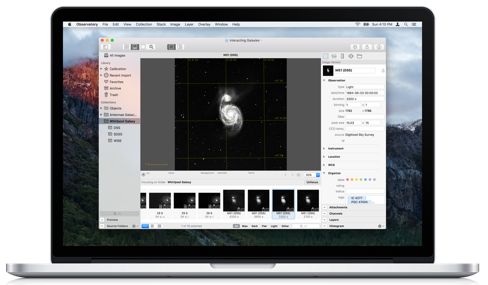 With Observatory, your Mac also gains the ability to display thumbnails and previews of astronomical images in Finder and other applications. And it helps Spotlight index the right metadata, so you can quickly find your images. 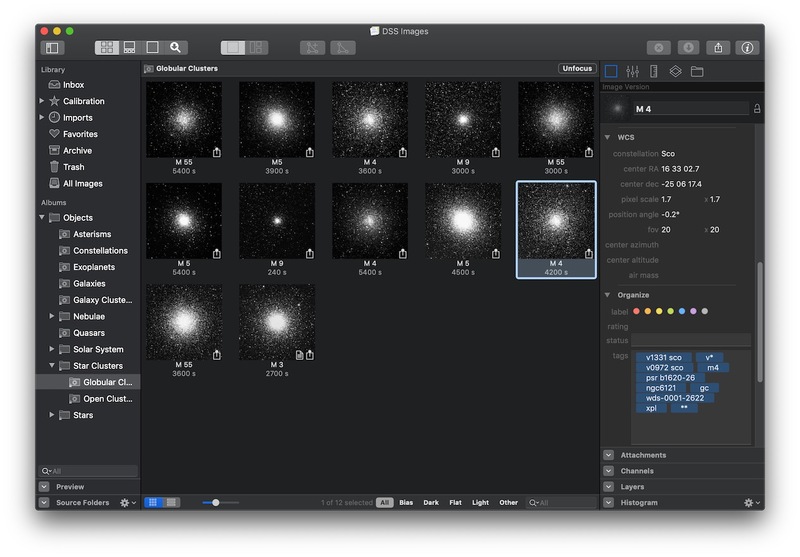 Your Mac isn’t familiar with image formats typically used in astronomy, so it displays them as generic icons in Finder, and it isn’t of much help to find them. Observatory changes this, by teaching it about astrophotography with Spotlight and Quick Look plugins for FITS, XISF (PixInsight) and SBIG files. 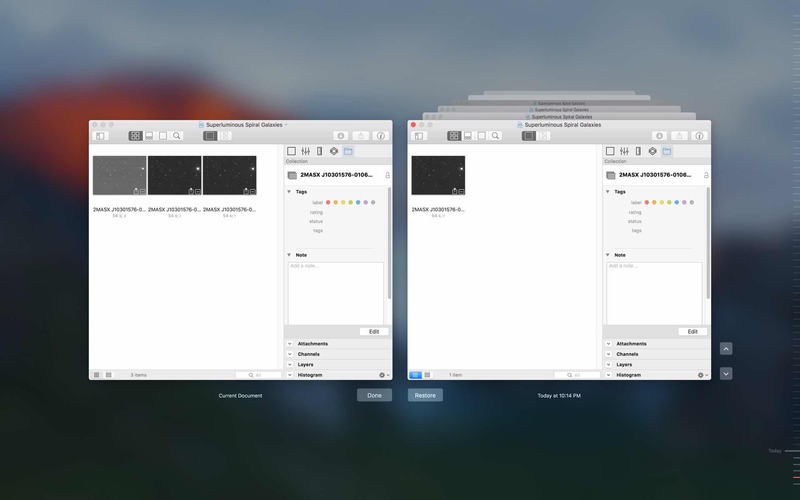 Now Finder and other applications can display thumbnails, and you can quickly preview them up-close. 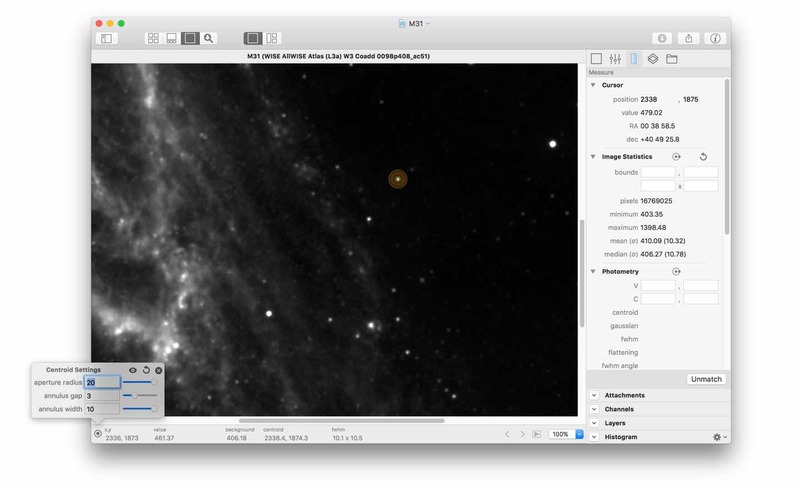 Your Mac automatically extracts metadata like image dimensions, exposure time, focal length, detector temperature, right ascension and declination from these files. 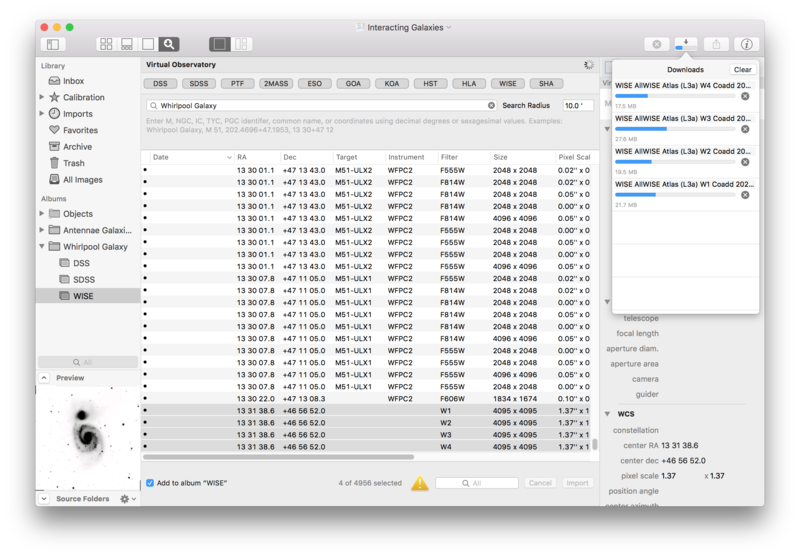 You can now find your images right from within Finder itself, and have it display some of this metadata. 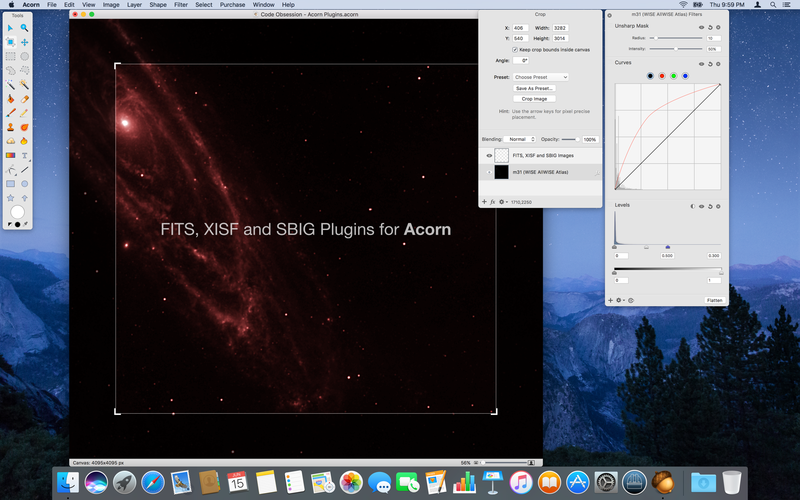 With Observatory and our Acorn plugin for FITS, XISF and SBIG images, you can open them directly and at full bit depth in this powerful image editor for post-processing. Conveniently access the research images of the Hubble, Spitzer and WISE space telescopes, 10 m W. M. Keck Observatory telescopes in Hawaii, 8.2 m VLT telescopes in Chile, 8.2 m Gemini North and South telescopes, 3.6 m New Technology Telescope, 2.6 m VLT Survey Telescope, 4.1 m VISTA, and many more. 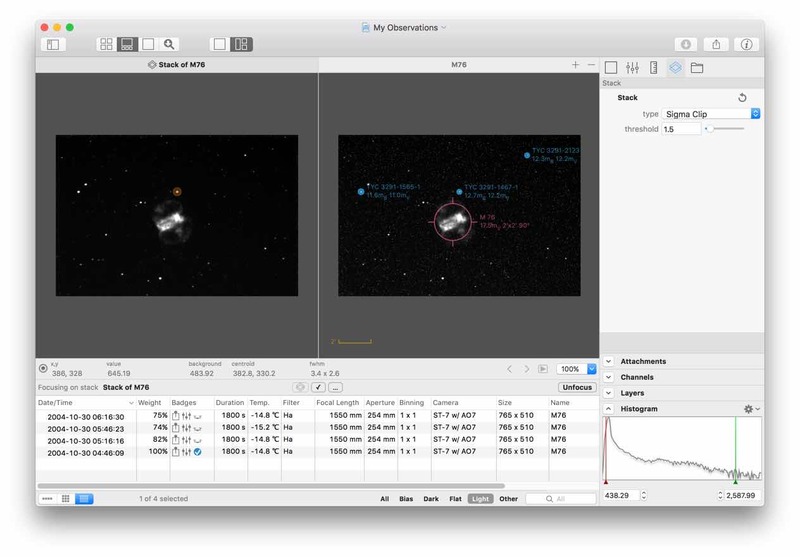 To help you decide which images to download, Observatory provides quick access to image previews, and allows you to filter results. Create a library for each of your projects and keep your images organized with albums, smart albums and folders. 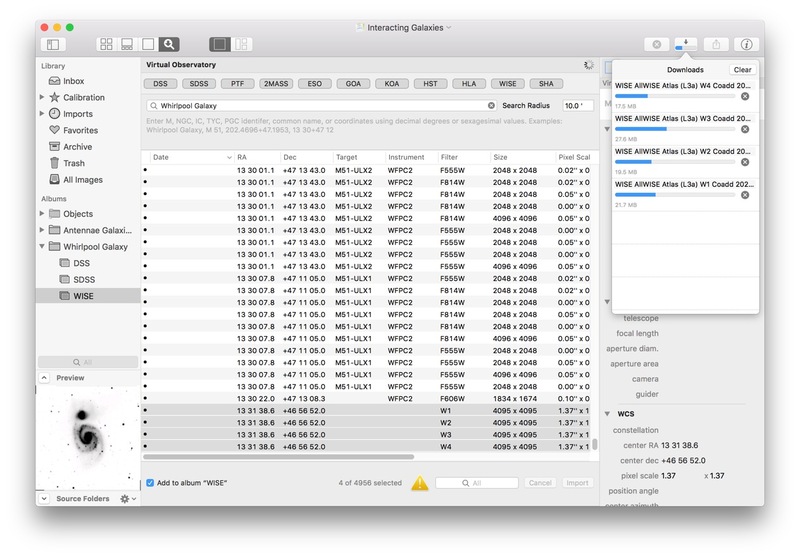 Let Observatory keep track of your images, without copying, moving or altering them. 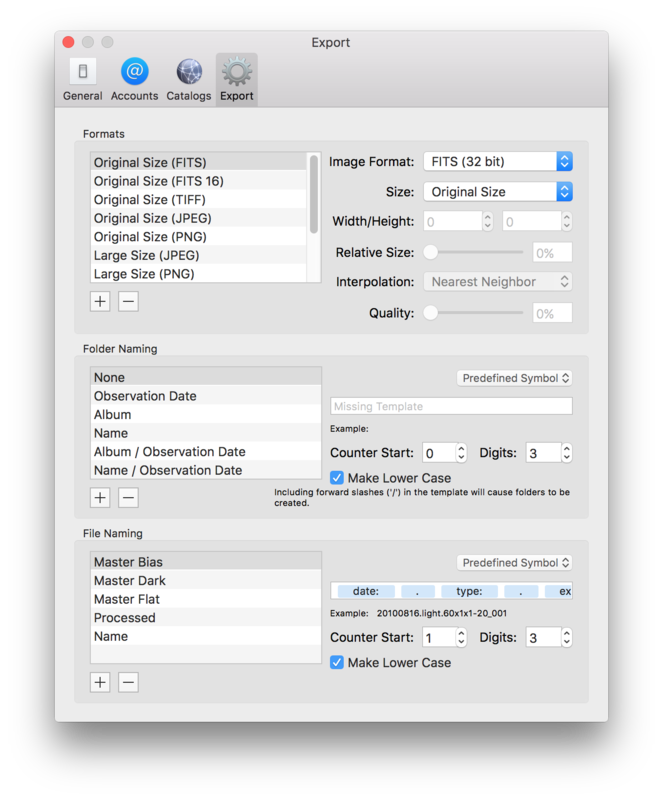 Observatory automatically normalizes the image metadata in its libraries, categorizes images, and supports metadata bulk editing. You can also manually tag, rate, color code, reject or archive images. And you can add notes or attach important reference material to your images and albums. Even without creating smart albums, Observatory will let you search images by type, name, tag, filter and status. A nondestructive preprocessing workflow without the hassle of intermediate files. 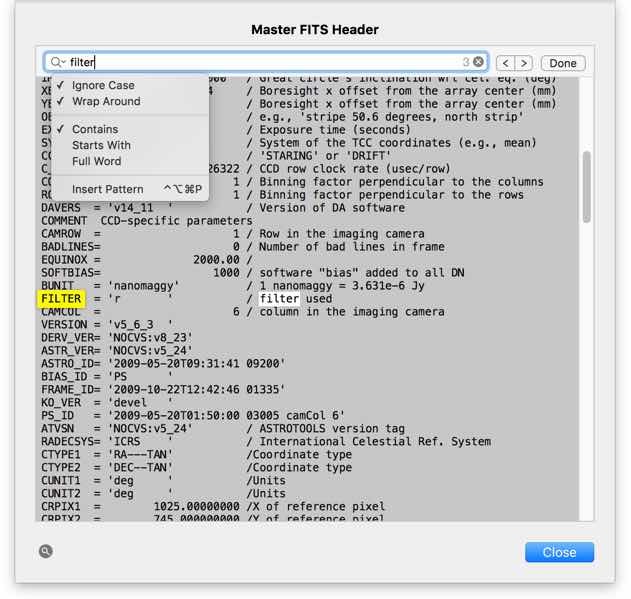 Create master bias, dark and flat frames, calibrate, remove hot and cold pixels, eliminate gradients caused by instrumental vignetting or light pollution, counter the effects of atmospheric dispersion, register and stack your images to bring out faint details, all nondestructively. You can create as many versions as you wish of an image and process each in a different way, without ever altering the master image. 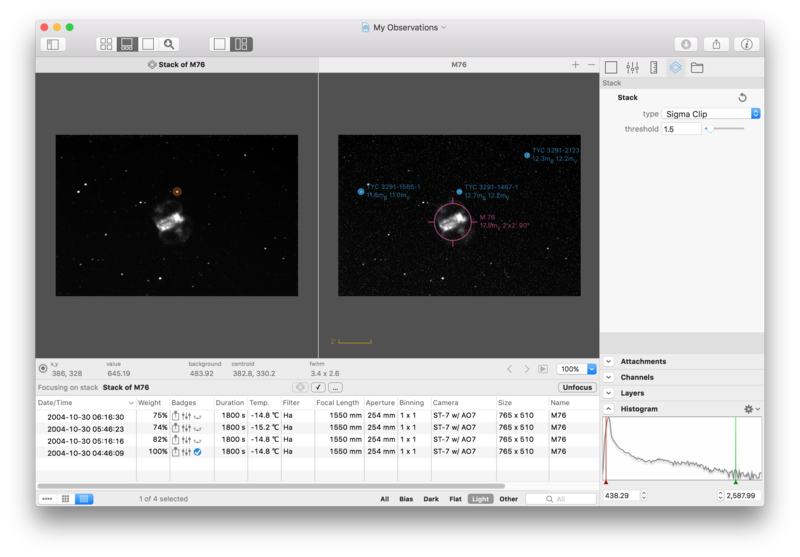 Image statistics, aperture photometry, PSF fitting and astrometry. 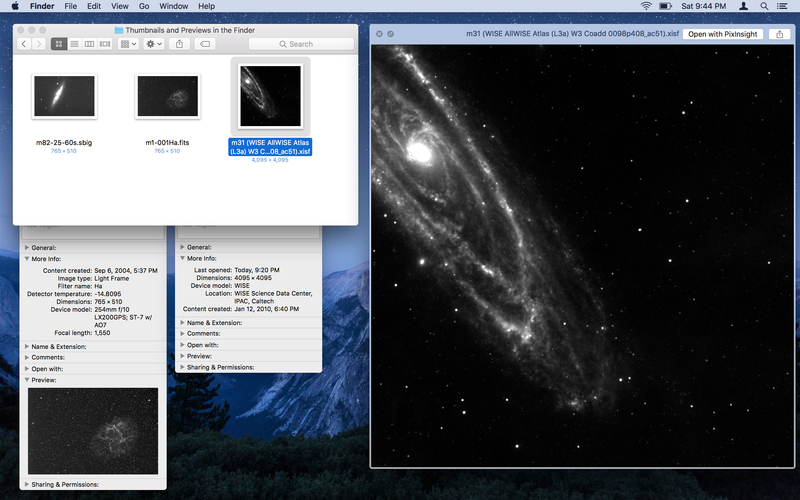 Observatory also lets you compare images side-by-side or blink them. With its advanced export preset support, you can easily convert your images to FITS, SBIG, TIFF, JPEG and PNG file formats, optionally resizing them, and use folder & file naming templates to conveniently export them any way you want. You can even share your images straight from Observatory using Mail, Messages, Notes, Twitter, Facebook, and more. 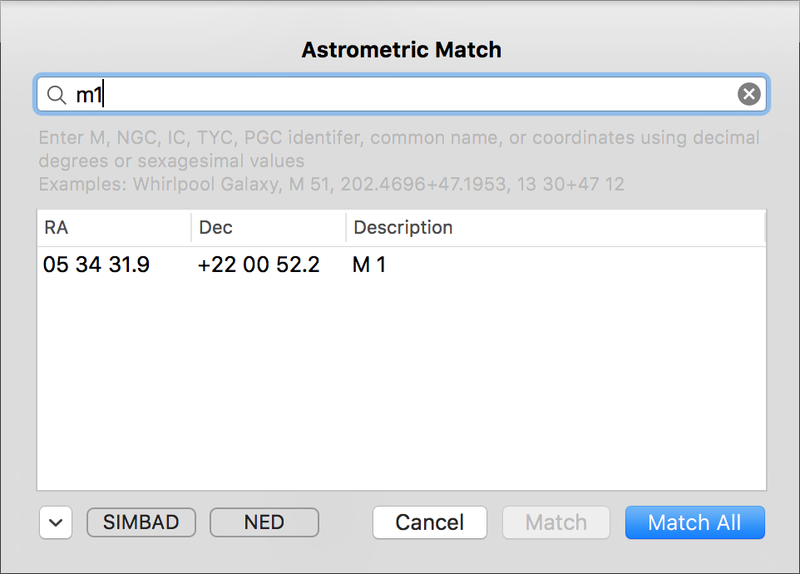 If some of your images lack the information to relate image pixels to actual sky coordinates, Observatory’s plate solver will help you find the best match, using its built-in catalogs, as well as the UCAC4 and USNO-A2.0 catalogs, and with help of the SIMBAD and NED services. 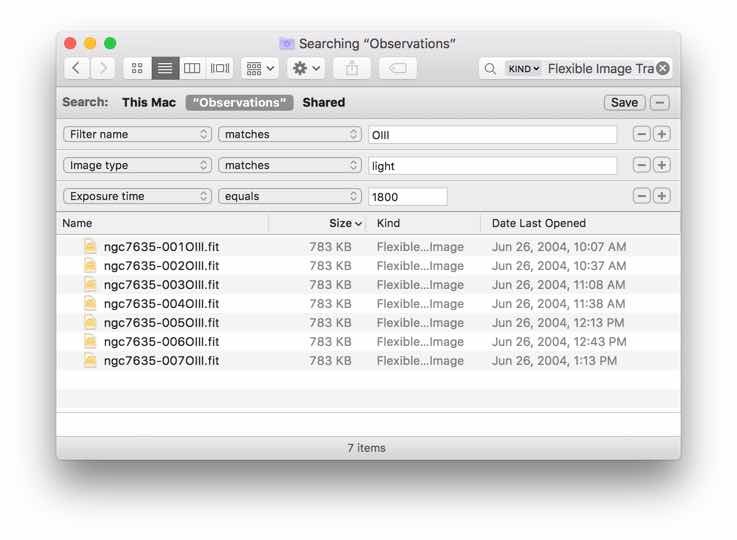 Observatory automatically tags plate solved images so you can easily find them back later by object category or identifier. 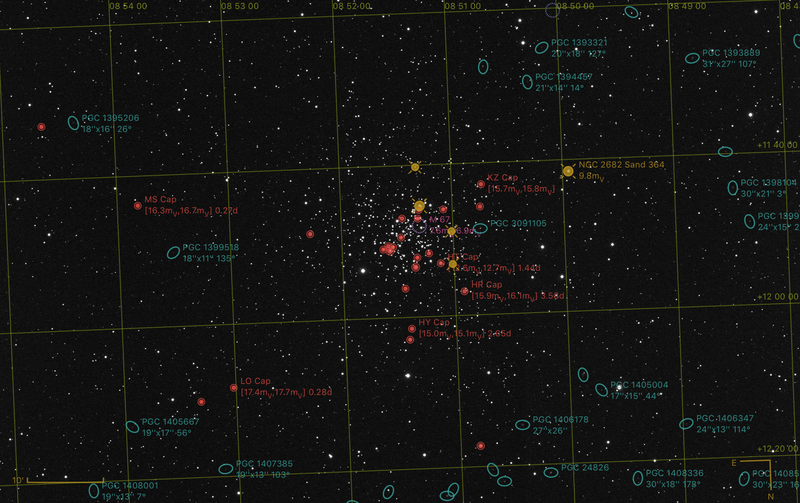 Discover what’s in your images by overlaying millions of stars, galaxies, planetary nebulae, confirmed exoplanets and other objects of the Messier, NGC/IC, Tycho-2, GCVS 5.1, WDS, CGPN 2000 and PGC 2003 catalogs, or use the UCAC4 catalog with over 100 million stars and the USNO-A2.0 catalog with over 500 million stars. Observatory is not limited to a single library. You can create a library for each of your projects, and have multiple libraries open at the same time. And they are all integrated with Time Machine. Observatory automatically normalizes the image metadata in its libraries, but you still can view and search within the original master FITS header.